Integrated continuous bioprocessing has attracted a growing interest due to its potential to improve agility and flexibility in the manufacture of therapeutic proteins. To convert an existing fed-batch cell culture process to continuous, or perfusion, the major technical hurdles include maintaining steady state cell culture performance and generating product with comparable product quality attributes. In this presentation, we evaluated three molecules including a fusion protein, an aglycosylated monoclonal antibody (mAb), and a glycosylated mAb. Steady state culture at high cell density was achieved for all three molecules, which allows the delivery of products with consistent product quality and adequate productivity. However, as compared to fed-batch processes, product quality and cell specific productivity differences were observed in perfusion cultures. Further studies indicated that it was feasible to modulate product quality in perfusion process by adding process levers in culture medium. It was also feasible to increase cell specific productivity through medium and process optimization. 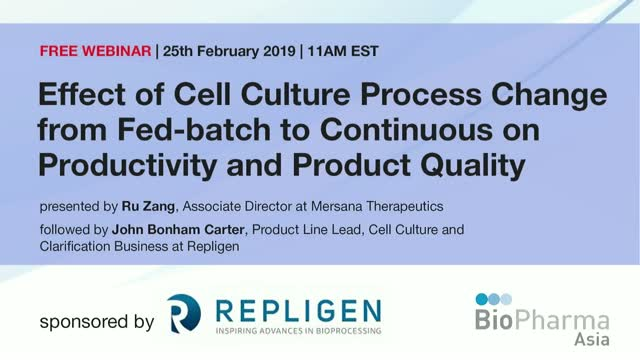 This presentation provides an insight into the product quality and productivity differences between traditional fed-batch and perfusion cell culture processes and potential approaches to addressing these differences.